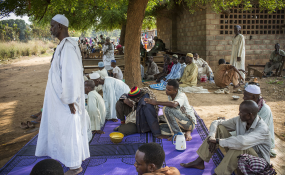 The Imam Ishmail Nafi at the displaced persons camp in the Ecole Liberte in Bossangoa praying for those killed the previous day during the anti-balaka attack on the town. Eleven people were killed outside his house while seeking safety from the attackers. Last week I was in Sibut, a town north of Bangui, the capital of the Central African Republic. People displaced by recent violence in Bambari, in the center of the country, were making their way to Sibut and told me what happened to them. Fighters from the rebel group Union for Peace in the Central African Republic (UPC), attacked Bambari on May 14, killing civilians, they said. One man, "Olivier", told me how his 7-year-old brother was shot as they tried to flee. "We ran down to the Ouaka River," he said. "We tried to swim across, but the UPC were near the bridge and shot at us. My brother was shot in the head and went under. I had no choice but to keep swimming." Members of groups such as the UPC are used to being able to kill at will. Since the country's descent into political and communal violence in 2013, thousands of civilians have been killed, and despite executions and sexual violence by all sides, only a handful of people have been prosecuted in the national courts. But these groups and their commanders should be less comfortable after today. The national assembly just took a big step by adopting the rules of procedure and evidence for the country's Special Criminal Court, a new court in the domestic system, which operates with international participation and support. Established by law in 2015, the court has a mandate to try war crimes and crimes against humanity committed since 2003. There is a special prosecutor, judges, chief register, and investigators appointed, and with today's adoption of the court's procedural rules, the prosecutor is set to formally move ahead with investigations. "Olivier" told me he was wanted to join the anti-balaka militia near Bambari to attack the UPC and avenge his brother's death. "Those who attacked us are not afraid to kill," he told me. "If nobody will stop them, then I myself can kill." I have heard this sentiment time and time again since 2013. But vengeance and retribution do not have to prevail. While there remain other challenges facing the court, not least victim and witness protection, and support and security for court staff, those committing war crimes should know that the wheels of justice are beginning to turn in Bangui. Lewis Mudge is Africa Senior Researcher at Human Rights Watch.